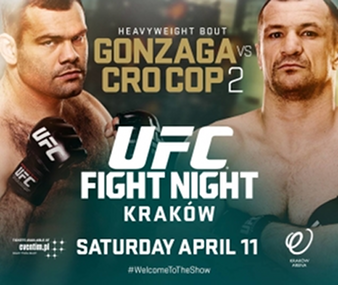 Watch the video replay of Gonzaga vs. Cro Cop 2 of UFC fight Night - held on April 11, 2015 at the Tauron Arena Kraków in Kraków, Poland. The main event featured a heavyweight rematch between Gabriel Gonzaga and returning veteran Mirko Filipović, who last fought in the organization at UFC 137 in 2011. Gonzaga won their first encounter at UFC 70 in 2007 via knockout due to a first round head kick. The kick has become one of the most famous and replayed finishes in UFC history.